Peter Bacon rounds-up the coming week of jazz events in the West Midlands. There is a great deal of excitement in a big band. All those burnished, brass instruments in massed ranks, four or five snaking saxophones at the front, the trombone slides shooting back and forth over the the sax players’s shoulders, the trumpeters standing tall at the back. To the side of them is the rhythm team – a studious pianist, a rock sold bass player, perhaps a guitarist – and the crucial driver of this whole multi-headed wild beast: the drummer. One of the great pleasures I’ve enjoyed since the summer has been the recorded sound of just such a band: the Jonathan Silk Big Band. 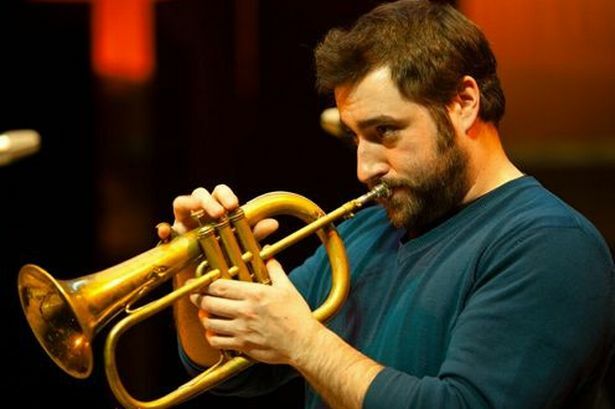 It contains nearly all the young jazz players you can hear around Birmingham in countless small combos, and it has recorded its first album, Uncouth, with trumpeter Percy Pursglove as star soloist. On Tuesday drummer Jonathan will be in the driving seat of his Christmas Big Band, which may contain many of the same players. And if a big band coming out of the hi-fi speakers is exciting, it is a pale thing in comparison with the experience of the actual players, especially when they are all squashed in to a small space. I’m not quite sure how Silk’s Christmas Big Band is going to fit into the room at The Spotted Dog in Digbeth , but I’m keen to find out. This mid-December gig is turning into a bit of an annual tradition, and Jonathan is promising some big band versions of festive favourites. Even that dreadful John Lennon dirge So This Is Christmas would be mightily improved with a big band chart, but I’m not expecting that one to be heard on Tuesday. Actually I don’t really care what they play – it’s the sheer, physical blasts of brassy air I’m after. * Before all that, tonight at the Silvershine Jazz Club in Bearwood , bright young pianist Reuben James is on the stand with Kansas Smitty’s House Band. The group recreates the excitement of the speakeasy bands of Kansas City, is based in London and is led by saxophonist Giacomo Smith. Reuben came to our notice as the leader of the Jazzlines Trio and was chosen by the late New Orleans trumpeter Abram Wilson to play in his band. Since then he has had choice gigs at the Cheltenham and London jazz festivals. * On Friday at 5pm, saxophonist Chris Aldridge brings his band Beebe into the Symphony Hall Cafe Bar for an upbeat, uptempo set of R’n’B-tinged jazz. The whole thing is free and there is more at www.thsh.co.uk/jazzlines .